Veracruz is located on the east coast of Mexico on the bottom of the curve of the Gulf of Mexico. The city was founded by Herman Cortez in 1519 and called Villa Rica de la Vera Cruz or Rich Village of the True Cross. The city’s story is one of disease, genocide, slavery, gold and silver, and pirates, all while it was becoming the most important port in New Spain. It was attacked and occupied four different times over the years and in 1902 was considered one of the most dangerous ports on the American coast. Eventually in 1991 the federal government took over, and the port and city were returned to prosperity. 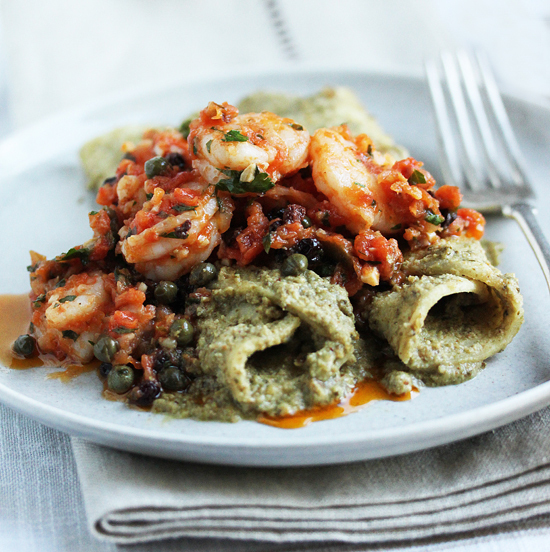 This dish has two substantial sauces — the Veracruz Shrimp Sauce and a Pumpkin Seed Tomatillo Sauce. The tomato sauce has familiar ingredients, but the pumpkin seeds were truly new to me. I think back in the day I had to drive across town to get them, but now, of course, they are available at any local market. Pan roasting them is always an adventure, as they pop out of the skillet. 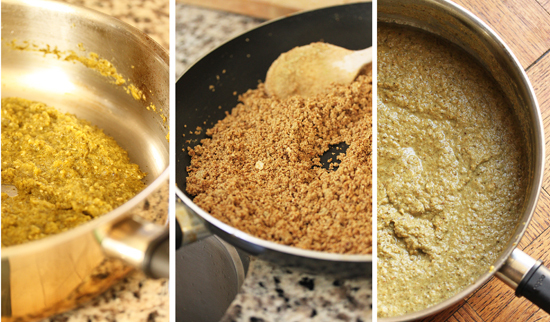 The Pumpkin Seed Sauce has two parts cooked separately and combined at the end. 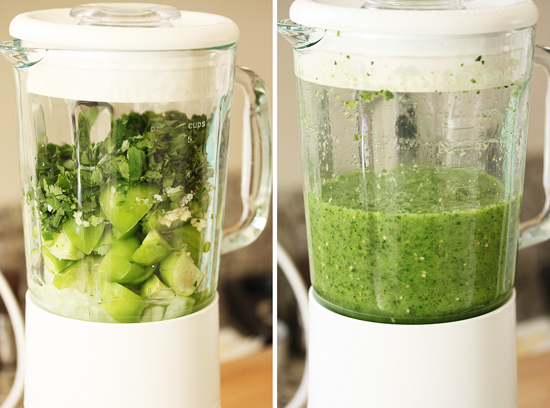 First the tomatillos, onions, jalapenos, cilantro, epazote and garlic are pureed in a blender, then sautéed until all liquid evaporates. 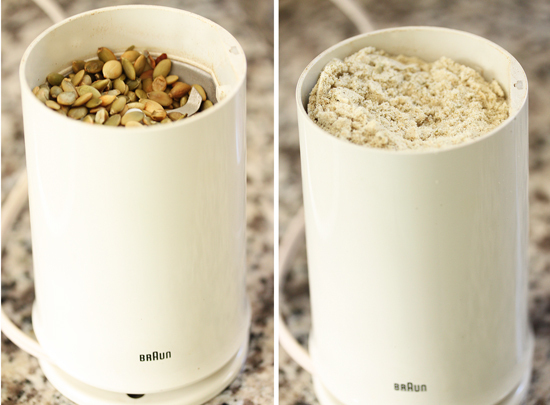 The roasted pumpkin seeds are ground to a light brown fluff in a spice grinder, mixed with oil and cooked until brown and have the texture of sand. The tomatillo puree reduction is added to the browned ground pumpkin seeds with water and the final sauce is a glorious nutty flavored concoction with notes of chilies, garlic and tomatillos. This sauce can also be used on chicken, pork or fish fillets. I’m thinking garnishing with a mixture of lime zest, pistachios and cilantro with a side of lime wedges. But I’m getting ahead of myself. 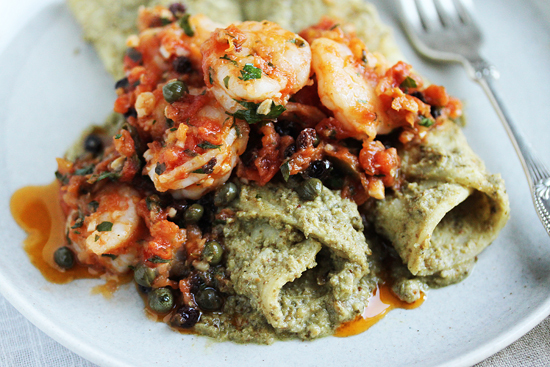 This dish with the corn tortilla robed in Pumpkin Seed Sauce topped by the shrimp with tomatoes, green olives, currants and capers will transport you to Veracruzana heaven. Yes, it is a long involved recipe, but absolutely, seriously worth it. Olé! 1. Make Veracruz Sauce and keep warm on stove or in oven. Can be made 1 day ahead and reheated. 2. Make Pumpkin Seed Sauce and keep warm on stove or in oven. Can be made 1 day ahead and reheated. 3. Cook tortillas in oil, blot dry, stack, then dredge in Pumpkin Seed Sauce, roll and keep warm in oven. Can be make 30 minutes ahead. 4. Saute shrimp and add to Veracruz Sauce. 5. Place 1 or 2 rolled sauced tortillas on serving plate, spoon additional Pumpkin Seed Sauce over tortillas. Spoon Veracruz Sauce with shrimp over tortillas. Serve. 1. Blanch tomatoes in 3 batches in a pot of boiling water 10 seconds per batch, transferring with slotted spoon to bowl of cold water. Peel, seed and finely chop tomatoes. 2. Heat oil in a deep 12-13-inch heavy skillet over moderately high heat until hot but not smoking, then sauté onion (without browning), stirring, 3 minutes. 3. Add garlic and sauté, stirring, until garlic and onion are pale golden, about 1 minute. 4. Stir in tomatoes, sugar, salt and bay leaves and bring to a boil. Reduce heat to moderately low and cook, uncovered, stirring occasionally, until most of liquid is evaporated, 20 to 30 minutes. 5. While sauce cooks, put oven racks in upper and lower thirds of oven and preheat oven to 200*F.
6. Add olives, currants (or raisins), capers and oregano to sauce and cook, stirring, 1 minute. Transfer sauce to a baking dish, discarding bay leaves. Cover and keep warm in oven. 1. Keep Pumpkin Seed Sauce warm, covered, on stovetop over low heat or in oven. 2. Heat oil in a 7- to 8-inch heavy skillet over moderate heat until hot but not smoking, then pass tortillas 1 at a time through oil with tongs to soften about 2 seconds per side. Blot both sides with paper towels and stack on a plate. 3. Flip stack over so slightly cooler tortillas are on top. Working with 1 tortilla at a time, dredge in pumpkin seed sauce to coat both sides, then roll up like a cigar. Place in a shallow baking pan, arranging side by side in pan as rolled. Cover pan with foil and keep warm in oven. 1. Pat shrimp dry, then toss with garlic and salt. Heat oil in 12-inch heavy skillet over moderately high heat until hot but not smoking, then sauté shrimp mixture, stirring and turning shrimp until cooked through, 3 to 5 minutes. 2. Stir shrimp and parsley into Veracruz Sauce. Put 1 or 2 rolled, warm tortillas on each of 8 plates and spoon more pumpkin seed sauce over them. Spoon shrimp mixture over tortillas. Serve. 1. Heat a wide 4- to 5-quart heavy pot over moderate heat until hot, about 5 minutes, then toast pumpkin seeds, stirring constantly, until puffed and beginning to pop, 3 to 6 minutes. Transfer to a plate to cool completely. 2. Pepitas: Working in batches, finely grind nuts in spice mill until they look like powder and feel like sand. Reserve. 3. Discard husks from tomatillos and rinse tomatillos under warm water to remove any stickiness. 4. Coarsely chop tomatillos, then puree in a blender or food processor with onion, garlic, chiles (to taste), epazote (if using), salt, ½ cup cilantro and ½ cup water until almost smooth. 5. Heat 2 tablespoon oil in heavy medium skillet over medium-high heat. 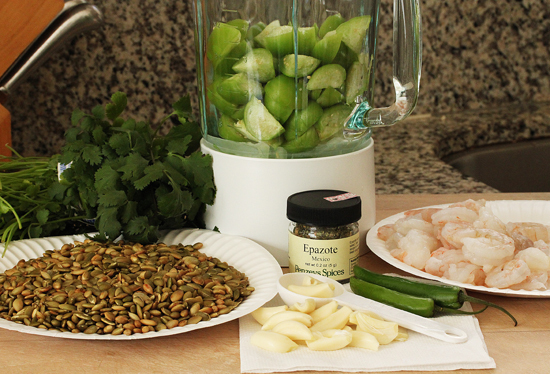 Add tomatillo mixture and simmer until sauce is thick and reduced to 1 cup, stirring frequently, about 5 minutes. 6. Heat 4 tablespoons corn oil in large pot over medium heat. Add ground nuts. Stir mixture until it resembles a coarse paste and begins to color, about 9 minutes. 7. Add tomatillo mixture and stir 1 minute. Add 2 cups water and bring to a boil. Reduce to simmer and cook until thick, about 3 minutes. Adjust salt. Keep warm on stove top or in oven. Notes: Veracruz sauce can be make 1 day ahead and cooled, uncovered, then chilled, covered. Reheat before proceeding. Shrimp can be tossed with garlic and salt 1 hour ahead and chilled, covered. Tortillas can be prepared no more than 30 minutes ahead and kept warm in 200*F oven covered with foil. Keep remaining pumpkin seed sauce warm on stovetop over low heat, in double boiler or in oven, covered. Thin with water if necessary before serving. Ohh this looks beautiful, fun, and tasty! I love good, authentic Mexican cuisine–it makes me feel better that I can appreciate it at its best, even when I occasionally succumb to a Taco Bell run, haha. There are some really nice flavours going on here! This looks great. I’ve made a Veracruz-type sauce before, but not a pumpkin seed one, but it looks wonderful. And I love shrimp and Mexican, so this is right up my alley. And it doesn’t look like it’d be too spicy for those that dislike dishes that are too spicy hot. Good recipe, good post – thanks. My mouth is watering now. That is gorgeous. you are seriously cookin up a storm over there! holy moly! I can’t get over how beautifully plated your dish is. The recipe is on my to-do list.